We had a fun day today ’cause my Lady made us some of them good homemade dog treats! We sure do love this good Homemade Peanut Butter Cookie Dog Treat Recipe! Now that’s some fine eatin’ right there! Seein’ as to how I don’t know what concoction goes in em, I’ll let my Lady do the tellin’ ya how part. Dog treats are fun to make, and of course your pooch will love them – but you have to make sure you’re using ingredients that are safe for their tummies. Some dogs are more sensitive than others, so sometimes it’s trial and error, but knowing and following “safe” recipes is always your best bet. Less is more when it comes to baking your own pup treats, so I’ve combined 3 simple ingredients (plus hot water) to make these delicious Peanut Butter Cookie Dog Treats. These treats keep well in the refrigerator for at least a week. Combine all ingredients in your mixing bowl. It’s important that you use hot – not cold – water, so don’t skimp on this step. You will want to stir your dough with a spoon or spatula at first, but it will eventually get to a point that you can knead it like bread dough. Eventually, it will all roll up into a ball. Flatten dough on counter, either with your hands or a rolling pin. If the dough is sticky, add a little more flour. I did not have any issues with the dough sticking to the counter, but there are many variables (like house temperature, altitude, measuring devices, etc), so don’t fret if yours does. Roll dough into 1 inch balls and place on a greased cookie sheet. You can use cooking spray or a healthy oil of your choice to prepare the cookie sheet. Bake at 350*F for about 15 minutes. Your pup can actually eat this dough raw, so don’t worry about undercooking. However, if you overcook the treats, they will be dry and crumbly. Once dough balls are on cookie sheet, flatten criss-cross style with a fork (like you do with peanut butter cookies for humans). This recipe will make a few dozen cookies. All ingredients are safe for human consumption. 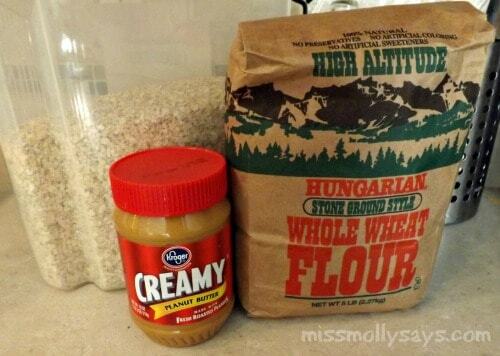 Combine all ingredients in your mixing bowl. It's important that you use hot - not cold - water, so don't skimp on this step. Flatten dough on counter, either with your hands or a rolling pin. If the dough is sticky, add a little more flour. I did not have any issues with the dough sticking to the counter, but there are many variables (like house temperature, altitude, measuring devices, etc), so don't fret if yours does. Bake at 350*F for about 15 minutes. Your pup can actually eat this dough raw, so don't worry about undercooking. 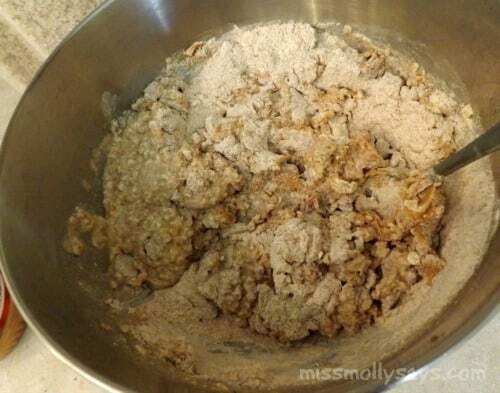 However, if you overcook the treats, they will be dry and crumbly. All ingredients are safe for human consumption. i made these, and even my pickiest dog loved them!!!! omg I sooo going to make some doggy treats for my brothers dog! 😀 I’m so glad I came to your blog! What a great recipe. Much healthier and cheaper than the treats you buy at the store. 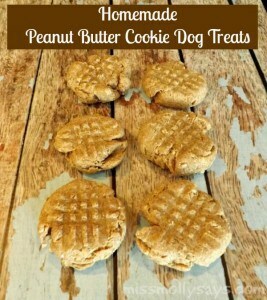 Homemade doggie treats are the best…I love that this is such a quick and simple recipe too! Although my husband and I only have cats and these dog treats don’t do us much good, I can definitely understand how you trust homemade treats more than the store-bought versions. I know I would definitely feel better about feeding our feline babies treats with safe ingredients that I trust instead of the store-bought kind. So if you’ve got any homemade cat treat recipes you have to share, I’d be happy to see! Every dog loves the taste of peanut butter and mine does too. He would love these treats. Thank-you for the easy recipe too! This looks like a great treat for dogs! My dad’s dogs love peanut butter ! I’d love to see how much they enjoy these. I bet fogs go crazy over this. Thanks for the recipe! What a simple and yummy recipe that I know my dog will love! I made these today and my pup seems to love them! I added some cinnamon to the dough. Also, since I only have the one little dog and this recipe makes a ton of dough, I made all of the balls, but only baked one batch. I am freezing the rest to bake a batch at a time. My doggy loves treats! I will definitely try your simple recipes. Thank you! I need to make these for my girls. It looks like they would be healthier than some of the treats I get from the store.